Delta Level Pro is a simple application providing a similar funtionality to a carpenters spirit level, with a small modification: It tells the user how much the corners/ends of the measured object must be moved either up or down. Most other level apps will provide either a measurement of offset in degrees or visualizing the offset angle by using a bubble, forcing the user to perform gradual, repeated adjustments to achieve a level object. 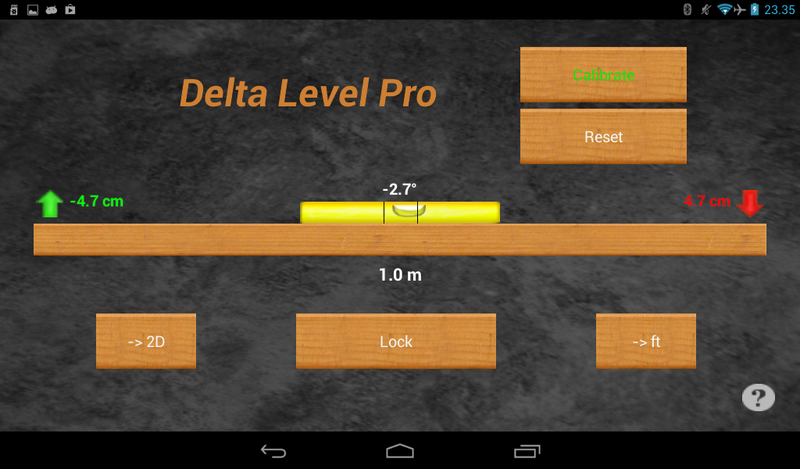 Delta Level Pro allows the user to do the adjustment in just one attempt. Note: Delta Level Pro is only as accurate as the device it is running on. A phone is a very small device, and may provide inaccurate measurements on slightly uneven surfaces. 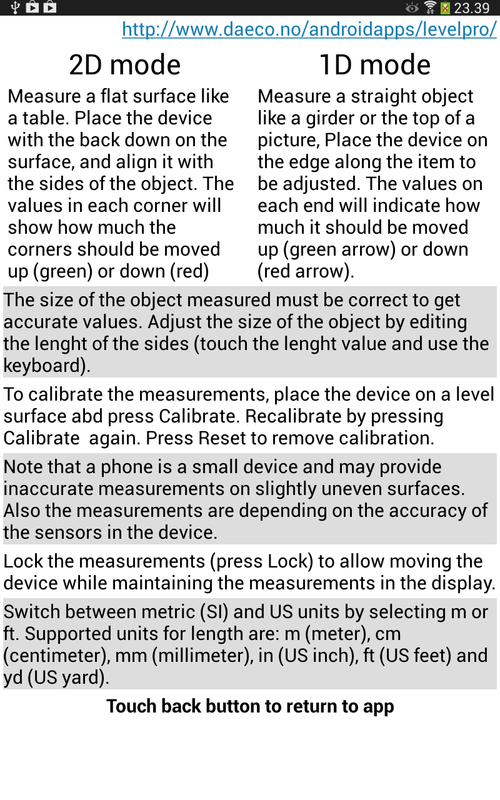 To achieve the most accurate measurement, it may be necessary to perform calibration (see below how). Also note that if your device uses protection covers, cases or similar this may skew the measurements. For support please email androidapp@daeco.no. Place the device (phone, tablet, etc.) on the object to be measured. Select 2D or 1D mode depending on if the object is a surface (like a table) or the edge of a object (like a girder or the top of a picture frame). Make sure the edges of the device are aligned with the edges of the object to be measured. In 2D mode the device should be placed flat on its back, and in 1D mode it should be place on its right or left edge (as indicated by the graphics). Calibration of the device (phone etc.) may be needed if it provides inaccurate measurements. Calibration is simply done by placing it on a flat, level surface and press "Calibrate". The title of the calibration button will change to blue to indicate the device has been calibrated. To calibrate again, press "Calibrate", to remove calibration press "Reset". Calibration should be done in the mode (1D or 2D) you want to operate in. Calibration values may be different in the two modes so a calibration done in 2D may be produce inaccurate measurements in 1D mode. Select if your measurements will be given in SI units or US units by pressing "m" (for meters) or "ft" (for feet). Entering the size of each side of the object by touching the values along the edges and entering the size using the keyboard. Using pinch movements (to zoom in or out). Read the values in the corners (2D) or ends (1D). Red numbers means the corner/end must be lowered, green numbers it must be elevated. Note that the object can either be lowered by the amounts shown or elevated with the amounts shown. 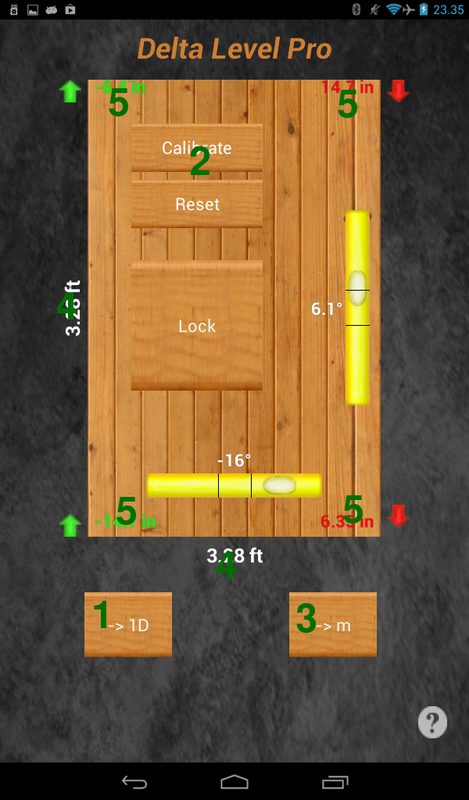 Adjust the object and measure again to ensure the object is now level. Note that calibration is very often required to get a good result, especially if the device is wrapped in a protective case or similar. 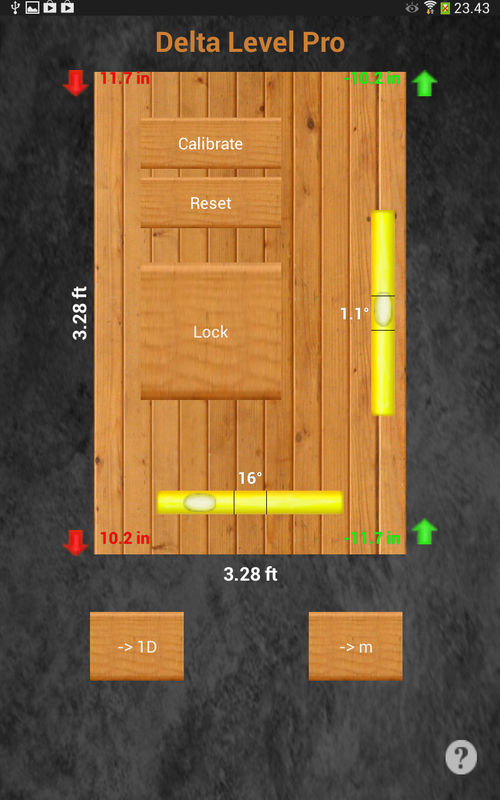 Also note that a phone is a rather small device, and checking the result using a carpenter spirit level or similar may be useful if very accurate adjustment is required, especially if the object is large. To lock the measurement while the device is being removed, press "Lock". The button title will turn blue. Presssing "Lock" again will unlock the measurements. Press (?) to open a short help page. We are always trying to improve our products. For feedback on Delta Level Pro (bug reports, requests for improvements and new functionality, complaints and praise) please send an email to androidapp@daeco.no.